For Charles Rowland and Edwin Paine, every day’s a holiday. They spend their time reading detective stories, watching thrillers at the movies or just hanging out in their sweet tree house hideout. You might say they’re living the life of very kid’s dream, if it weren’t for one small problem – they’re not alive at all! Best friends from beyond the grave, these two ghost have decided to live (so to speak) out their dreams and begin solving crimes themselves. But when they take on their first murder case, Charles and Edwin find out that the truth is stranger – and more dangerous – than fiction. An immortal madman is killing the runaway children of London, not even the city’s spirits are safe. Can the Dead Boy Detectives solve the case, or will a fate worse than death make them give up the ghost for good? This was a cute little read following the hapless adventure of two ghost children. By the sounds of it, or just by going from the cover and blurbs, it sounds like it is a spin off of Neil Gaiman’s The Sandman and if that’s so then I want to read that now as well (I’ve read the Graveyard Book which was entertaining, but not enough so for me to hunt down more Gaiman books). It is quite English in some cases which makes sense because that is the setting, but when I say English I also mean Sherlock Holmes sort of time period with how the boys speak and they even go one step further and dress like media detectives with hats and coats and magnifying glasses. 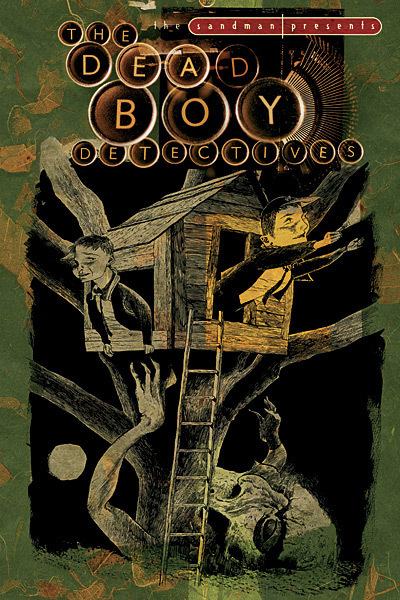 There is dark content in this graphic novel with black magicians, dried up corpses, the death of children, but the detectives are so cute. They’re also quite daft and don’t really act like ghosts which is interesting, but I guess that also adds to the innocence the story portrays of them. The art to me is standard comic art and only the art on the chapter pages stand out for me. What really matters is the content and story which is what dominates. I hardly noticed the art because of the story which doesn’t always happen and this is probably one of the first out of 5 (or 6?) I’ve read during my challenge that has had that effect. I recommend it if you like a bit of dark side, but feel like some humour.